Former European Integration (2003-2005) and Foreign Affairs Minister, Deputy to NATO's Secretary General responsible for public information, Kolinda Grabar-Kitarovic (Croatian Democratic Union, HDZ), won the second round of the presidential election on 11th January in Croatia. She won 50.74% of the vote and beat outgoing President Ivo Josipovic (Social Democratic Party, SDP), who was running favourite before the first round - he won 49.26% of the vote. A gap of 32,435 votes lay between the two candidates. In the first round on 28th December Kolinda Grabar-Kitarovic was beaten by the outgoing Head of State as she won 37.22% of the vote and Ivo Josipovic 38.46%. The Croatian conservative candidate, whose party HDZ succeeded in mobilising its electorate also enjoyed from substantial vote transfer from Milan Kujundzic (Croatian Dawn-People's Party HZ), a candidate who was running for an 8 party right leaning coalition "Alliance for Croatia" in the first round (6.3%). She was able to count on the diaspora's vote also - on 28th December since 91.11% of the Croats living abroad voted for her and only 8.89% voted in support of the outgoing President. Ivan-Vilibor Sincic, a member of the NGO Zivi Zid (Human Shield) committed to the support of the poorly housed, who won 16.42% of the vote on 28th December, did not give any voting advice. Unlike his rival the outgoing President supported by all of the left wing parties in the first round did not have any voting reserves. "The country is divided. What matter is whether the new President will maintain her discourse of unification and consensus? Kolinda Grabar-Kitarovic's victory will undoubtedly be an advantage to the HDZ in the next general elections (planned to take place in less than a year)," declared Zarko Puhovski, a professor of Political Science at the University of Zagreb. Turnout totalled 59.06%, 9 points more than in the 2nd round of the previous presidential election on 10th January 2010 and 12 points more in comparison with the first round on 28th December. "There is no place for triumphalism," declared Kolinda Grabar-Kitarovic when the results were announced. She did however say: "I promise you that Croatia will be a prosperous, wealthy country and one of the most developed in the EU and the world," adding "I shall not divide the people, on the contrary, I shall look for a way to unite it, to settle the issues we have, the poor economic situation, all of the social problems the country has. Let's work together for the prosperity of Croatia." "I expect there will be change in foreign policy which will undoubtedly be more focused on NATO and the EU and less on the Balkans," indicated Andjelko Milardovic, a researcher for the Migrations Institute. Pro-actively nationalist, Kolinda Grabar-Kitarovic delivered a firm message to neighbouring Serbia and promised to set drastic conditions on Belgrade's entry into the European Union. The most popular political personality in the country, outgoing President Josipovic did however suffer because of Croatia's poor economic situation. After the first round of voting Prime Minister Zoran Milanovic (SDP) admitted that his government's poor economic results had undoubtedly represented a "burden" for the outgoing President. 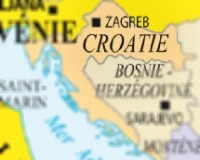 Indeed Croatia has been in recession for the last six years. The government debt is high (in 2013 it totalled twice that of 2008) and unemployment that totalled 13.7% in 2012 now totals 17.7% and is twice as high amongst young people. The sector of tourism, an important source of income for Croatia did not do well in 2014 due to the weather and the absence of Russian tourists - a consequence of the sanctions taken by the EU against Moscow. These sanctions also obliged Milanovic's government to put major investment projects on hold in the energy sector. Ms Grabar-Kitarovic, who is 46 years old, comes from Rijeka and is a graduate of the University of Zagreb in English, Spanish and International Relations. She also studied in the USA, a country where she spent her childhood and adolescence notably at the George Washington University, Harvard and Johns Hopkins University. After working in the diplomatic corps she was elected MPs in the general elections on 23rd November 2003. In the same year she was appointed European Integration Minister in the government led by Prime Minister Ivo Sander (HDZ). In this post she was responsible for Croatia's negotiations to enter the European Union. Two years later she was appointed Foreign Minister and European Integration Minister. In 2008, Kolinda Grabar-Kitarovic became Croatia's Ambassador in the US before joining NATO three years later where she became the first woman to be appointed Deputy Secretary General to the Secretary General responsible for public information. The presidential election on 28th December and 11th January is undoubtedly a pre-cursor to the general election at the end of this year that the HDZ is approaching as the favourite. "The president will work with a new government at the end of the year," said the leader of HDZ, Tomislav Karamarko, when the results were announced. As she takes over from Ivo Josipovic in the Pantovcak Palace, Tito's former villa on the hills that overlook Zagreb, Kolinda Grabar-Kitarovic will be the first woman to be elected president in this country. She will take office on 19th February next.